« Are the Medications You Take Contributing to Premature Bone Density Loss? Why Get a Chair Massage? One of the many things I am proud of is my Working Well Massage chair stations in Whole Foods Markets. I am proud of this business because it serves multiple needs for a variety of people. For one thing, it provides a means for people with limited time or funds to receive massage. For another, it allows potential table massage clients to try out different massage therapists before they commit to a one-hour table massage. And it allows people to experience muscular pain relief in as little as 5 minutes (although 15-20 minute massages can give you more results!). I’ve been working in and managing chair massage stations for the past 9-10 years. In that time, my massage therapists and I have helped hundreds, if not thousands, of people relax, experience pain relief, learn about their own bodies and how to better care for their muscles. Selfishly, I myself have also received hundreds of chair massages at the Working Well Massage stations! I love the convenience because I don’t need to make an appointment. I love being able to shop for some good healthy grub and then plunk down in the massage chair, trusting that my team will take good care of me. Not because I manage them, but because they are highly trained and skilled massage therapists and they treat all WWM clients well. Sine I am such a big fan of chair massage myself, I thought I’d list a few reasons why you might want to check chair out massage for yourself. And so that you don’t think I am entirely self-serving, I’ll offer this up: Get a chair massage somewhere, whether you get it from a Working Well Massage station or through someone else. 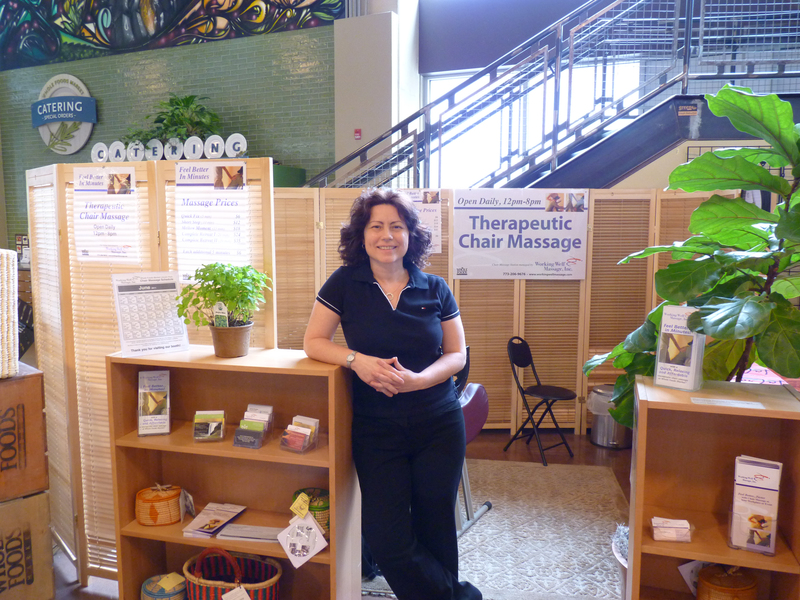 WWM has only two locations in Chicago for chair massage. For those of you in the suburbs or other areas of the country, many Whole Foods stores offer chair massages. but there are other places to get chair massage as well. Shopping malls, salons, airports, all these places may offer chair massage. More and more, many workplaces are bringing in companies like Working Well Massage to offer chair massage to their employees. It’s a great motivator, boosts productivity and sure beats sending your people out to the doctor for a muscle spasm that might have been prevented if they had regular massage. • Is fast and easy-no need to take off your clothes or get oil on you! • Can release muscle tension in your neck and shoulders, upper and lower back. Sitting in a massage chair angles your upper body in way that is optimal for the massage therapist to address your neck and shoulder without a massage table in the way. • Tends to cost less than table massage. I can buy four 20-minute chair massages a month for the same price as one 1-hour table massage. So I get more attention to the areas that are sore more often. • Allows you to sample a massage therapist’s work without a big time or money commitment. • Provide work for massage therapists and chance to meet new clients. • Can help relieve headache pain causes by tight muscles. • Can help reduce muscle pain causes by overuse or repetitive motion activities (ahem, computer users work their upper backs and neck muscles all day). • And lastly, it just feels good! I always feel better after a chair massage. The world seems brighter, my mode is lighter and I feel refreshed and relaxed and ready to face the next round of emailing and smart phoning! Really this is nice post.Thanks for share. Hello Yoga Bolster, Goodbye Neck and Upper Back Pain! Massage and Prostitution-What's the Difference?